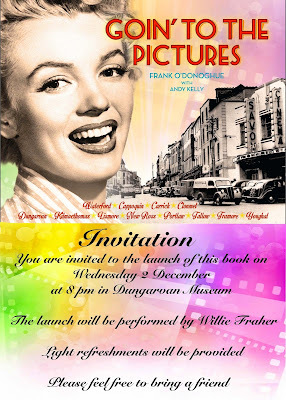 Goin' to the Pictures is the name of a new book by Frank O'Donoghue, with excellent photographs compiled by Andy Kelly. It is an affectionate recollection of the pre-television era when the cinema was the most popular form of entertainment. The book will be launched by Willie Fraher. Well illustrated throughout, this book is very readable. Experiences are recounted by those who frequented the cinemas in Dungarvan, Youghal, Tallow, Lismore, Cappoquin, not to mention the mobile film providers who visited the village halls on a weekly basis. A good Christmas present and well worth the €15.